I used to have a rule for myself that I would only felt the birds I had actually seen. This changed last year when people started asking me to make owls for them (I've seen owls in captivity but not in the wild). Now, with selling to people on Etsy, people from all over the country (world!) are seeing my stuff, so I figure I can do birds from anywhere. I'm looking forward to making all kinds of warblers I've never seen. Anyway, this little guy has talked to me many times from his page in my bird guide, and finally I could not resist him any longer. His name is common redpoll, but he looks anything but common to me. If I saw him in a bush, I'd go crazy, he's so adorable. 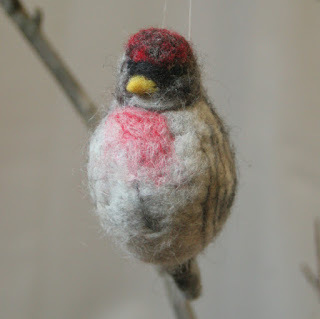 Oh my goodness, I LOVE these felted birds! !